A touch of Italy in the heart of central London. A luxury boutique Hotel, the Baglioni Hotel combines a mix of light and space with elegance, chic and atmosphere for a contemporary yet bespoke Italian hospitality experience. The striking lobby is decked in marble and mustard, black chandeliers and grey and gold colour scheme. Overlooking Kensington Gardens and with views of Kensington Gardens (part of Hyde Park). The Baglioni Hotel offers every floor its own personal butler service. All bedrooms feature air-conditioning, plasma TV screens with cable channels, minibar, safe, hairdryer, Expresso makers and broadband internet connection and the hotel has an evening turndown service. Other Hotel amenities include 1500 free music tracks, 100 new films which can be downloaded to the in-room interactive TV and a butler service for each floor. Bathroom come with bathrobes and slippers. Iron and ironing board can be requested. All rooms have 24 hour room service. Free movies and music for all rooms. Some rooms also feature a fireplace. Superior rooms: apx 25 square metres. Deluxe rooms: apx 30 square metres. Some rooms have a private terrace with table and chairs. Executive rooms: apx 35 square metres. Some of the executive rooms give the guest access to a private courtyard with table and chairs. Suites: Each floor has a personal butler service and 24-hour room service. Some rooms have a four-poster bed. The bathrooms have dark wooden parquet, a mirror and two copper washbasins imported from Morocco, a shower and bathtub. Deluxe Junior Suite (apx 42 sq metres) and Executive Junior suites (apx 45 sq meteres) have their own entrance foyer. Deluxe Junior Suite comes with a Illy espresso machine and two plasma televisions. Courtyard Junior Suite: apx 42 square metres. Overlooka quiet, elegant courtyard. They are open-space suites with a private foyer entrance which opens onto a spacious day area. Deluxe Suite: apx 55 sq peters. Comprise two rooms with a private foyer leading to a spacious day area. Some may have access to a private terrace with table and chairs. Executive Suite: apx 62 square metres. Comprise two rooms with a private foyer leading to a day area with a chenille or silk sofa and armchairs with cushions and a coffee table. The hotels 2 presidential suites have wonderful views out over Kensington gardens as well as their own terrace. In May 2007 the hotel completed the chic Royal Suite. A stunning living area with no less than three bedrooms (master bedroom has fireplace), four bathrooms and two reception rooms (both with fireplace). The suite covers an area of 240 metres and its terrace has views over Hyde Park. Each room has a flat screen television and the latest in sound systems while the bathrooms have Jacuzzi tubs and either black marble or dark wood floors. The suite comes complete with a 24/7 personal butler. Osteria 60 Restaurant: Italian restaurant located on the ground floor. The textured gold walls and bronze pendants create a decadent atmosphere in which you can enjoy the vibrant and colourful cuisine of well known chef Ivan Simeoli. The dominant feature to the restaurant is the six foot wide Venetian mirror above a large fireplace along with grey and gold velvet armchairs and Murano glass candelabras. Best of British seasonal products blended with classical Italian dishes using fresh ingredients (many from Italy) with a sculptural and modern twist. The menus offer a variety of classical Italian dishes with a twist and where colours and taste are beautifully combined. 88 seat capacity and a pleasant outside terrace facing Kensington Gardens. 500 label wine list. Open: 07.30 till 10.30 (till 11.00 weekends), noon till 15.00, 18.00 till 23.00. Afternoon Tea 14.30 till 17.00. Osteria 60 bar: Open till 01.00. Serving a full range of drinks such as cocktails, whiskies and fine cigars. The Baglioni hotel also created its own private night club in 2006. Called the 'Boutique 60' the hotel describes it as having a refined atmosphere. For the business traveller there is a No.1 meeting room facility which is capable of hosting a maximum of 60 delegates. Other business services include a full range business centre, broadband internet connection and secretarial services. Guests can relax and unwind in the tranquil surroundings of the Spa and Wellness centre with its wide range of treatments (natural, therapeutic and anti-ageing) and programs. Open 09.00 till 21.00 (till 20.00 Sunday). There is also a steam room and fitness room. Since February 2006 the hotels guests have been given the chance to drive a luxury Maserati Quattroporte Executive GT courtesy car within a 1.5 mile radius of the hotel. The hotel lobby has a complimentary WiFi connection available in the public areas. Should you need to store luggage this facility can also be provided. Nearest: Tube Station: High Street Kensington 0.3 miles (0.5 km), Railway Station: West Brompton 1.1 miles (1.8 km), Motorway: M4 Junction 1 4. 1 miles (6.6 km). The Baglioni Hotel London is located on the corner of Hyde Park Gate and De Vere Gardens in the central London and upmarket area of Kensington. Opposite Hyde Park and a very short walk from the Royal Albert Hall as well as Kensington Palace (former home of the late Diana Princess of Wales) this is a prime location. Close to the start of the popular shopping and other amenities to be found on Kensington High Street and just a little further to Notting Hill at the top of Kensington Church Street. In short you are surrounded by a never ending supply of shops, bars, restaurants and entertainment venues while staying in one of the most upmarket areas in London. Other nearby attractions include Royal Geographical Society 0.4 miles (0.6 km), Albert memorial 0.5 miles (0.8 km), Serpentine gallery 0.5 miles (0.8 km), Earls Court Complex 0.9 miles (1.4 km) (1.4 km) Holland Park Theatre 0.9 miles (1.4 km) (1.4 km), Holland Park 0.8 miles (1.3 km), Albert Memorial 0.46 miles (0.7 km), Buckingham Palace 1.8 miles (2.9 km) and Natural History and Science Museums 0.6 miles (1.0 km). Private parking is available on site and costs £50 per day. Milestone Hotel and Apartments: is 163 yards (149 metres) away, has a guest satisfaction score of 100% and rates start from about £319. Belmond Cadogan: is 1.1 miles (1.8 km) from here, earns a customer rating of 80%. Lanesborough Hotel London: 1.4 miles (2.2 km), rated at 99% and with rates from around £572. Halkin Hotel: 1.4 miles (2.3 km), rated at 98% and with rates from around £294. Compared to other London hotels: This hotel has been rated 91% by past guests. The London average is 80% and the average for 5 star hotels is 89%. Therefore this hotel is above average for its sector (star rating) and for London as a whole. Leading Hotels across the chain average 92% so this hotel is slightly below the guest rating for most Leading hotels. Below average for a Leading hotel but still a hotel to consider. The hotel remains better rated than most London hotels and additionally ranks above the average guest rating for 5 star hotels. Milesfaster ranking: 80th from 866 London hotels, 6th of 11 Leading Hotels, and 46th of 131 five star rated hotels. We can also point you towards a lower price option, the Grange City Hotel. 0.1 miles away (0.1 km), achieving a rating of 82% by its past clients with base rates starting at about £111. 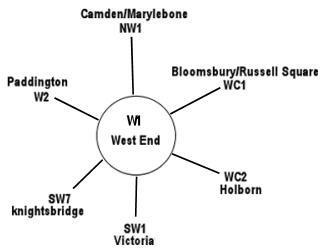 The 51 nearest hotels around this area (60 Hyde Park gate, SW7 postcode) which we have have on our website extend out to a 0.7 miles (1.1 km) radius. The numbers by star rating are 8 five star hotels (average rating 89%), 32 four star hotels (average rating 81%) and 10 three star hotels (average rating 75%). Coming out as the top rated hotel is Milestone Hotel and Apartments (5 star) at 99%. Base Rates: We compare area starting room rates by using base rates. Bear in mind we use the published base rates which do not reflect short term offers and deals. They do however give a decent relative comparison. Looking at all hotels in the area the average base rate is £127 per night. They range from a low of £49 at Montana Hotel (3 Star, 80%) and the Eden Plaza Hotel (3 Star, 75%) up to £378 at Baglioni Hotel (this hotel) (5 Star, 91%). Rates break down to the following for each star rating: Five Star average: £190, Four Star average: £126 and Three Star average: £78. Using our in-house algorithm we rank hotels based on guest ratings and weighted for related factors. We have a ranking for Baglioni Hotel 3rd of 51 and 2nd for the 8 five star hotels in the area. Our base rate rank for the hotel is 50th of 50 (8th of 8 five star hotels.). We use the base rate ranking and review ranking for the hotel to get an overall ranking of 22nd of 46 for sheer value for money (Milestone Hotel and Apartments was top). The bar nominated in 2005 for the best bar in the Villegiature hotel awards. Was called the De Vere Park Hotel (2004) .